Josh Buchanan is an expert on small-school pro prospects and has named his first ever “Offensive Lineman of the Year Watch List”. Of note for Hillsdale College football fans is Jared Veldheer’s name on that watch list. 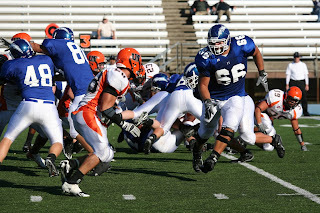 The senior offensive tackle joins fellow GLIAC member Bill Behling, an offensive guard at Michigan Tech. The list features the best linemen in FCS (formerly 1-AA), D2, D3, and NAIA. View it here.